The past 6 days was hard! My website crashed last Friday morning (2/5/16) about 5 am, and after 3 days back and forth with my hosting company they figured out that there was a problem with their server. Now….here’s where the question lies in my mind. That just happened to be 24 hours after I got a CRAZY number of pins on Pinterest for my post – How to Tackle an Advanced Crochet Pattern, which led to a crazy amount of traffic back to my site. So crazy in fact that in 24 hours that post was my #2 post of all time! (My #1 post has always, ALWAYS been How to Make a Magic Ring….I mean always! ….many thanks to Google for sending me tons of traffic to it!) I guess this is what they call a viral post? Ha! I’ve never had one, so I want to be excited – I’m just still reeling over the week of down time. I somehow still wonder if all the traffic was what caused my site to crash. But, they switched me to a new server and everything seems like it’s back to normal. We’ll never know, so enough rambling…. 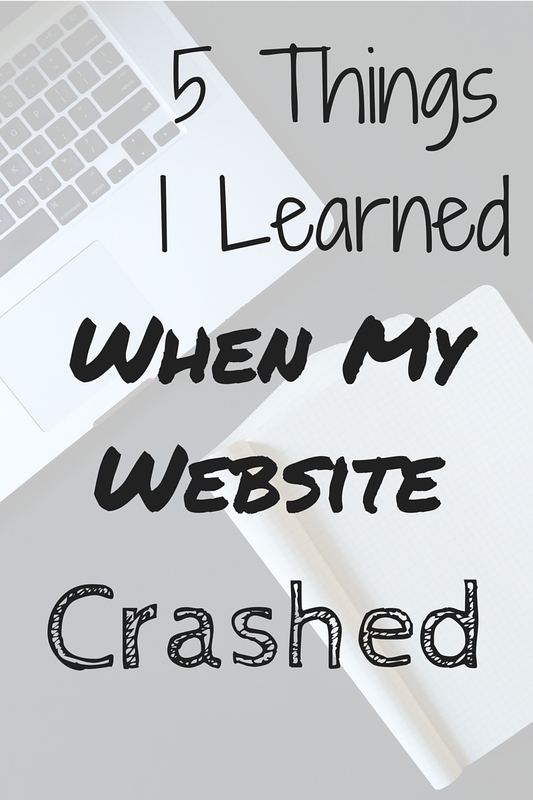 I had a whole week without my blog – I couldn’t see it, I couldn’t log in, nothing…. – which had me doing a lot of thinking. And I learned some things about myself and my business through the whole experience. Good customer service is worth more everything! – We all know this, but when you’re in the middle of what feels like a crisis you kind of hope for expect decent customer service. I worked customer service all my life (before staying home with my kids) and I loved helping people. So, as I walked through this, with what felt like poor customer service, this was a good reminder for me as to the kind of service I want to provide to my readers and customers. I don’t care to know how to run a tracert (or even care to know what it is) – Now because this is kind of what my hubby does he knew what this was, and he didn’t think I should have had to do it from my end. (Refer back to #1). I want my blog to work, end of story. I don’t want to have to run tests, especially when the problem isn’t on my end. I don’t care how to transfer an ip address – Because I sat on hold long enough one day, I was able to figure it out and did it myself. (Refer back to #1) But honestly, I really didn’t want to know or learn that. It’s just not what I want to do – and I now give even more credit to those of you who love these sort of things. I love blogging more than I thought – For years I have felt like I “needed” to have a blog. Being removed from it all together made me realize I want to write. I don’t want to troubleshoot problems, I don’t want to transfer ip addresses, I just want to share my crochet knowledge with all of you. I guess I finally found the voice that I thought I didn’t have and all of a sudden I have things to say. My husband is way more supportive of my business than I ever thought he was – My husband doesn’t say much about my business. Some days he makes jokes like…. “If I ever fall I won’t get hurt with all the yarn you own”. There have been a couple rare occasions where he said he didn’t want me having a business. (Mostly because I homeschool, and I’m at the dance studio 5 days a week, etc. And if the housework starts to slip, or I start to get overwhelmed, he wonders if my business should be the first thing to go.) But most days he doesn’t say anything either way. He did however say 2 things this week that totally shocked me. The first was that he would come home every day from work and ask if my site was back up. (He does care!) And second, in the midst of all my site stuff going on, my fb page was just 1 “like” away from 6500. He said, “If I was on facebook I’d be your 6500th fan.” Awww…. love him. When everything seemed so difficult, this totally made it better. I’m sure there were other lessons along that way, but those are the ones that really stuck out to me. For now I’m just happy life is returning to semi-normal. Now I can get back to my crocheting….